Soleymani*, S., Bahramsoltani, R., Rahimi, R., Abdollahi, M. (2017). Pharmacokinetic interactions of Hypericum perforatum L. (St John's wort) with conventional drugs: a review of clinical studies. 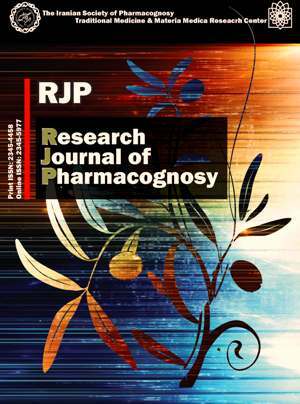 Research Journal of Pharmacognosy, 4(Supplement), 123-123. S. Soleymani*; R. Bahramsoltani; R. Rahimi; M. Abdollahi. "Pharmacokinetic interactions of Hypericum perforatum L. (St John's wort) with conventional drugs: a review of clinical studies". Research Journal of Pharmacognosy, 4, Supplement, 2017, 123-123. Soleymani*, S., Bahramsoltani, R., Rahimi, R., Abdollahi, M. (2017). 'Pharmacokinetic interactions of Hypericum perforatum L. (St John's wort) with conventional drugs: a review of clinical studies', Research Journal of Pharmacognosy, 4(Supplement), pp. 123-123. Soleymani*, S., Bahramsoltani, R., Rahimi, R., Abdollahi, M. Pharmacokinetic interactions of Hypericum perforatum L. (St John's wort) with conventional drugs: a review of clinical studies. Research Journal of Pharmacognosy, 2017; 4(Supplement): 123-123. 1Department of Traditional Pharmacy, School of Traditional Medicine, Tehran University of Medical Sciences, Tehran, Iran. 2Department of Traditional Pharmacy, School of Traditional Medicine, Tehran University of Medical Sciences, Tehran, Iran. PhytoPharmacology Interest Group (PPIG), Universal Scientific Education and Research Network (USERN), Tehran, Iran. 3Department of Traditional Pharmacy, School of Traditional Medicine, Tehran University of Medical Sciences, Tehran, Iran. Evidence-Based Medicine Group, Pharmaceutical Sciences Research Center, Tehran University of Medical Sciences, Tehran, Iran. 4Toxicology and Diseases Group, Pharmaceutical Sciences Research Center, Tehran University of Medical Sciences, Tehran, Iran. Department of Toxicology and Pharmacology, Faculty of Pharmacy, Tehran University of Medical Sciences, Tehran, Iran. Background and objectives: Hypericum perforatum L., commonly known as St. John’s wort (SJW) from the family Hypericaceae is a famous medicinal plant used to treat mild to moderate depression; so, it might affect the pharmacokinetics of numerous drugs. Due to widespread herb-drug interactions of SJW, this study was designed to review the clinical evidences regarding the interaction of SJW with the metabolism of conventional drugs. Methods: PubMed, Scopus, and Web of Science were searched with the keywords "Hypericum perforatum" or "St John's wort" and "interaction", "co-administration" in the title/abstract of the articles, from inception until April 2017. Results: The clinically important interaction of SJW with immunosuppressants, cardiovascular drugs, anticoagulants, statins, chemotherapeutics, oral contraceptives and benzodiazepines has been proven. SJW decreased ciclosporine plasma concentration and caused acute rejection in solid organ transpantation. Concomitant use of SJW with warfarin decreased the platelet aggregation. Unintended pregnancies were induced by concomitant use of SJW and oral contraceptives. SJW caused treatment failure and drug resistance when combined with indinavir, boceprevir. Hyperforin, one of the main components of SJW, plays a crucial role in the induction of cytochrome P450 enzymes and P-glycoprotein transporter. Low-hyperforin SJW extracts do not interact with drugs such as digoxin, oral contraceptives, and cyclosporine and thus, maybe more suitable for administration in patients who receive multiple medications. Conclusion: Interactions between SJW and prescribed medicines can lead to serious clinical consequences. SJW should be properly labeled to alert consumers regarding the possible drug interactions.